A report from Oakland Institute documents in detail the many rights abuses faced by the Maasai in the Ngorongoro and Loliondo regions of Tanzania. 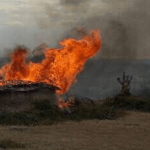 In recent years, hundreds of Maasai homes have been burned and tens of thousands of people evicted from their land in the name of conservation and safari tourism. Maasai from four villages in Loliondo sued the government of Tanzania in September 2017 for the right to return to their villages which have become part of a safari park. But, according to the Pan African Lawyers Union and the Oakland Institute, the government is intimidating and criminalizing villagers and ally NGOs to leave the case. Community members involved are calling for international attention in their hopes that it will force the government to cease its abuses and allow the legal case to move forward.